Welcome to Washington School, one of eight schools within the San Gabriel Unified School District. In 1887, bonds were sold to raise funds to build Washington School. The site selected was at the intersection of the roads to the San Gabriel Mission and the Southern Pacific Depot. This is the present location of Washington School. Washington School was completed in 1888. The newly built Washington School won National Honors for the best architecturally designed school in the United States. It was built for the grand sum of $1,200, including the cost of bringing lumber from Minnesota. Washington School has had many outstanding alumni with General George S. Patton being the most famous. As a young lad, he rode his horse down San Marino Avenue from his home located near the Huntington Library. In 1923, the original two story wooden and brick structure gave way to a new Spanish style school with tiled roofs. The bell from the tower was saved after the old school was demolished. It was mounted on a scaffold in the north playground and continued to be used to call students to school. 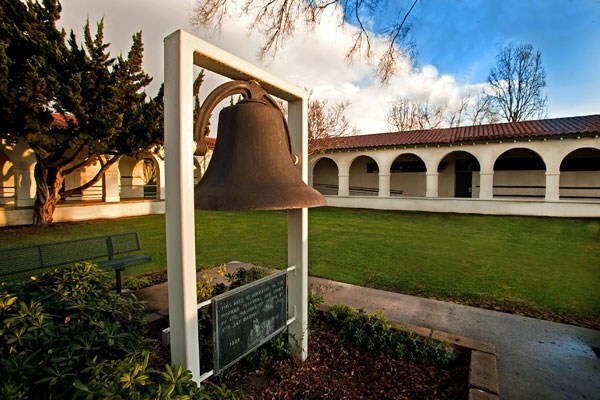 The bell was moved to the front of the school in 1956 when two new wings and an office were added. In 1990, the bell was moved again. Washington School’s Student Council built a planter for the bell in the shady quad section of the campus where it could be viewed by students, parents and the community. During the spring and summer of 1993 Washington School was modernized through special state funding. This money was allocated for schools in California that met the requirement of being at least 30 years old. As a result, the school now is air conditioned. In 2002, the San Gabriel Community successfully passed a school bond. This allowed Washington School to improve plumbing, electrical wiring, renovate two student bathrooms, and build three new classrooms. Washington School is proud of its rich historical background and educational excellence. The needs of the whole child are met through an educational program based upon the total involvement of the teacher, parent and child.